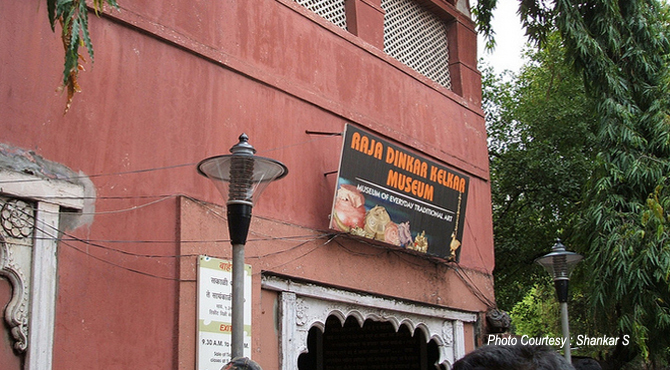 Raja Dinkar Kelkar Museum of Pune is situated on Bajirao Road, Shukawar Peth. It is one of the excellent museums in Maharashtra, depicts the tradition and culture of India. Founded by Dr Dinkar G. Kelkar in remembrance of his only son, Raja, it occupies a Peshwa period mansion. One of the distinctive features of the Museum is that, the collection was assimilated by Dr Dinkar in his lifetime. He started gathering artifacts from the year 1920 and by 1960. Initially, he used to exhibit these collections to friends and family and day by day, his collection started growing in number and attracted many visitors in addition to his family members. With the help of state government as well as local bodies, his collection started growing further. And in 1962, he handed his entire collection to the Department of Archaeology of the Government of Maharashtra. Presently, the collection boasts of more than 20,000 articles. The museum houses a vast collection of items from all parts of India, including architectural fragments, sculptures, paintings and innumerable small objects associated with everyday life such as ivory and wooden combs, pots, lamps, pens ink stand, kumkum boxes and evern ornamental foot scrubbers. The museum also houses carved woodden doors and windows from Rajesthan, Gujrat, Kerela and Karnataka. The Mastani Mehal is the main attraction and the reconstruction of audience room from Mastani Mehal is also incredible. The other structures inside its complex include Research and Storage facilities and the Institute of Musicology and Fine Arts. The first floor galleries display basss and ceramic pots and dishes, paper mache utensils and wooden kitchen wares, such as decorated noodle makers. A large variety of textiles is presented in the Second Floor Galleries. The emboroidered children's clothing is particularly delightful. There is also a remarkable range of brass lamps, figurines, ink pots, ritual spoons and betel nut crackers. Musical instruments and painted textiles are seen in the extension of the Galleries in the other half of the museum. The Ground Floor Galleries, which are visited only at the ened of the tour, show ivory games, Betel boxes, pen boxes, chess sets, lime containers and carved wooden doors, many dating from Peshwa times. Entry fee: Rs 15 for Indian Visitors and 100 for foreign visitors.